FXpansion has just announced the release of DCAM: Synth Squad, their brand new suite of advanced synthesizer instruments. The advanced DCAM analogue modelling technology carefully reconstructs the sound of vintage hardware on your computer at a fraction of the cost. At the heart of DCAM: Synth Squad are three modeled synthesizers - Strobe, Amber and Cypher - bulging with the weight and power of old-skool analogue, according to FXpansion. These are no mere emulations stunted by the limitations of the past. Instead, they combine the best features from legendary machines with new and exciting ideas to drag them kicking and screaming into the modern world. Also included is Fusor, a semi-modular layering and performance environment for the DCAM synths with a high-quality FX suite, advanced step-sequencer/arpeggiator and flexible modulation. Designed to be as easy to program and satisfying to play as an analogue monosynth, Strobe also adds polyphony, osc-stacking, a versatile multimode filter and deep modulation to create a modern classic. Strobe specializes in no-nonsense analogue-style leads, sick basses and complex pads. 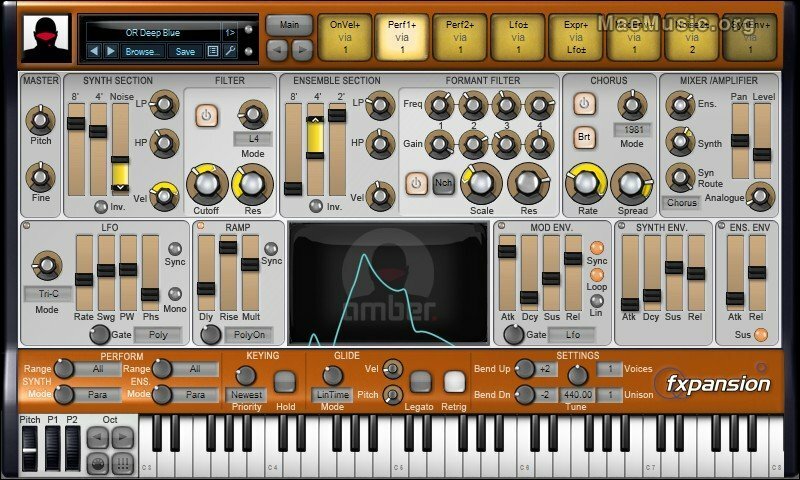 One of the first attempts to realistically model the divide-down string ensemble synths from the '70s, Amber captures the lush, psychedelic sound of these much-loved but often-forgotten instruments. A formant filter, 3 separate chorus models, a variety of playing responses and flexible modulation build upon the legacy to deliver a new take on these vintage classics. A multi-oscillator synth geared towards audio-rate modulation and other advanced oscillator functions, Cypher takes analogue FM to the next level. It combines the rawness and tone of analogue oscs with modern luxuries like polyphony, precise tuning and a wealth of innovative features made possible by digital technology. Dual waveshapers and filters also contribute to make Cypher a unique synthesis tool. Evoking the era of huge wrap-around analogue keyboard rigs, Fusor is a semi-modular layering environment for the DCAM synths with extra LFOs, envelope followers, step-sequencers and a suite of high quality FX. Fusor's deep modulation capabilities allow you to use a synth's LFOs and envelopes to drive other synths, FX and other devices, making it a sound design environment limited only by your imagination. • Oscillators that "ooze heavy sound pressure". • Amp stages that can be overloaded. • MIDI Learn, BPM-synced LFOs and envelopes. • Multiple oversampling for ultra-high quality mixdowns. • Intuitive and powerful modulation system. • Inspiring and creative preset library. • Compatible with all major plug-in formats and sequencing environments - Windows / Mac OS X - VST / AU / RTAS. • Comes complete with a large suite of presets ready to play and tweak. DCAM: Synth Squad is now available worldwide for £157 / $249 / €189 (excluding local taxes where applicable).